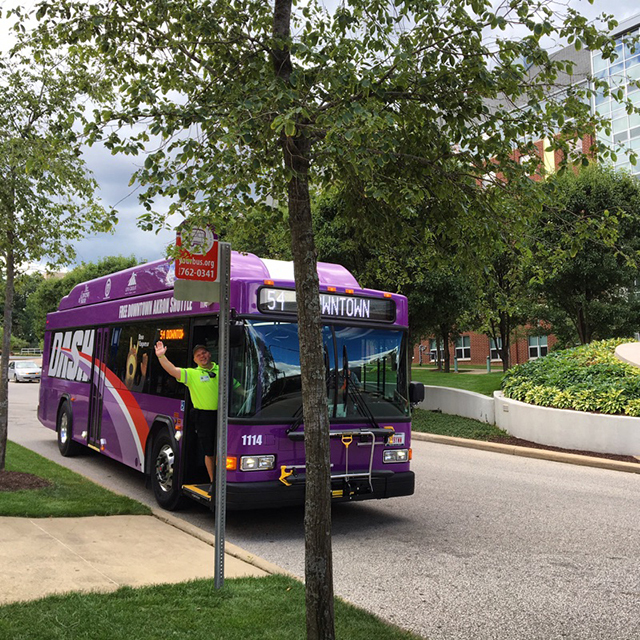 Have you ever seen a big, purple metro bus driving around Akron? This fun and fresh METRO bus is the new downtown circulator. Students, business professionals, Akron citizens and guests of Akron are welcome to cruise around Downtown Akron for free on the DASH. On a brisk Monday afternoon, I decided to take a spin on the DASH. 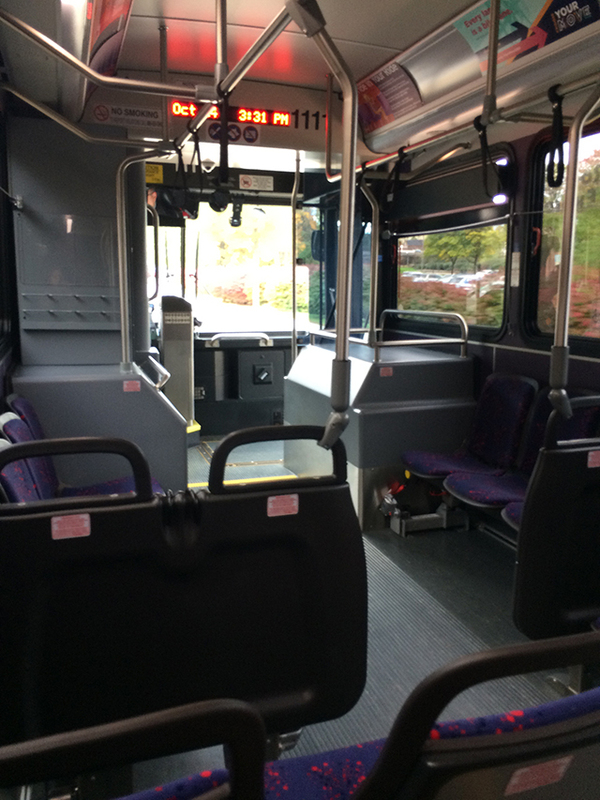 This was my first time riding a metro bus and I was pleasantly surprised how clean it was. 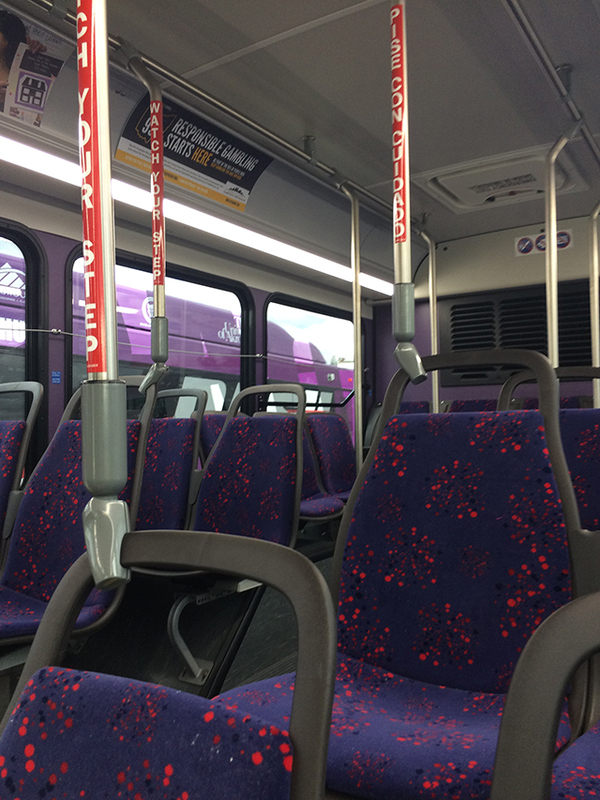 The bright purple seats and the big windows were welcoming as I stepped on. I found a seat and started my ride along with three others already aboard. The first stop was to the Akron METRO Transit Center. The bus stopped for a few minutes to allow travelers to transfer buses and allow those who utilize park and ride enough time to get on the bus. After a few minutes, we were on our way again. The stops along the way were the 401 Lofts, the College of Business Administration, Quaker Square, the College of Arts and Sciences, and then back to the Polsky Building. As a University of Akron student, the DASH has many stops that appeal to students and give access to parts of campus that are far to walk to. Every student knows the Polsky building is a decent hike, but the DASH allows you to go from the main part of campus to Polsky in 2 minutes flat. It's a much quicker - and warmer - way to get to and from Polsky. The people that I encountered on the bus were friendly and most were fellow students. It was a smooth and easy ride with little disruption. Overall, the DASH is a great way to travel downtown efficiently and quickly. A round trip during the school day rush hour took me 29 minutes with stops. With buses that arrive every 10 minutes from 7 a.m. to 7 p.m. and every 15 minutes from 7 p.m. to 11 p.m. on the week days, you're guaranteed to get from place A to B in a flash!